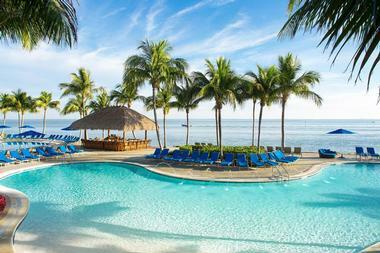 Florida has family-friendly resorts on both coasts and in the Keys that could rival any resort in the Caribbean. Putting the passports away and heading to the Sunshine State could provide the perfect opportunity for a memorable family vacation. From Disney’s Animal Kingdom Lodge to Hawk’s Cay, there are ample options to fulfill families’ visions for their dream vacation. Whether it’s luxury villas and a 5-acre waterpark or mini-golf followed by s’mores over a beachside fire pit, these 25 resorts will hit the mark. 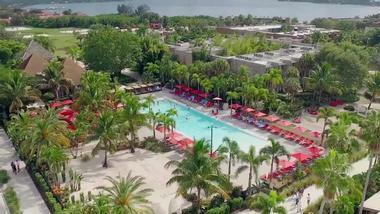 The active family would be wise to consider Club Med Sandpiper Bay. Like all Club Med resorts, it offers a wide range of sports facilities and high-class instruction in activities ranging from table tennis to flying trapeze. Both individual and group lessons are available. There's a wide range of age-specific kids' clubs, children's activities, and a waterpark for the whole family to enjoy. It's not just geared towards sports fanatics, however. There are spa facilities for both adults and kids over 11 for some relaxation. 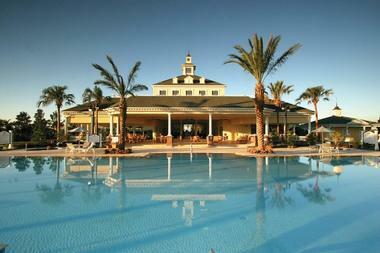 Sandpiper Bay also boasts two excellent restaurants and a golf course. It is located two short hours north of Miami. 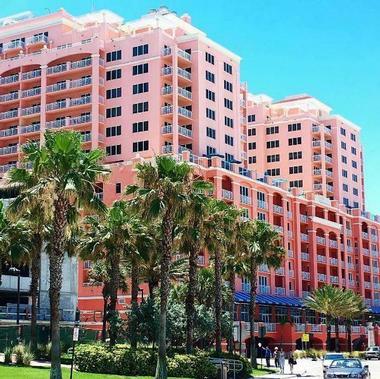 The historical Don CeSar Hotel offers spacious rooms and suites in a luxurious setting as well as onsite beach house suites that are perfect for families and groups. 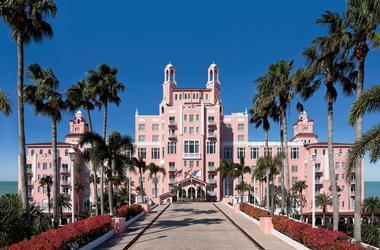 The Don CeSar has a well-deserved reputation for being one of Florida’s most kid-friendly resorts. Young guests can enjoy crafts and activities at Camp CeSar in half-day or full-day sessions, or attend Kids’ Night Out events on Friday and Saturday evenings. The whole family will enjoy visiting Uncle Andy’s Ice Cream Parlor for a sweet treat after a delicious meal of coastal cuisine at one of the hotel’s restaurants or lounges. If you are planning a family reunion in Florida, Eau Palm Beach Resort has over 30,000 square feet of meeting and event space. With its dedicated event team on hand to make sure everything runs smoothly, Eau Palm Beach is an ideal choice for hosting events with pizzazz. There three ballrooms, 10 breakout rooms, and an outdoor event space. But it's not all about big events. Guests can enjoy the small things too, from piña colada cupcakes at Breeze Ocean Kitchen, visiting the Loggerhead Marine Life Center – a sea turtle hospital responsible for 9.5 miles of beach and thousands of hatchlings annually, where turtles can be viewed in the special gallery – or just dipping a toe in the luxurious pool. Focusing on golf and spa retreats, Hammock Beach Resort also boasts its very own marina. Just 90 miles west of Orlando's famous theme parks and close to the region's best attractions (including the Kennedy Space Center), Hammock Beach is a great option for families who want to explore beyond the resort. However, there are also plenty of activities to keep guests entertained at the resort too. Hammock Beach has a 91,000-square-foot water park, a number of oceanfront restaurants, and sporting activities that include the most challenging golf course in the state, designed by golf champion, Tom Watson. All this is combined with luxurious spa facilities and stunning views of the Atlantic Ocean . Located on Duck Key in the Florida Keys, Hawk's Cay Resort is a haven for watersports lovers. They offer WaveRunner rentals, parasail rides, a dolphin experience, a kids’ club, and an 85-slip marina. 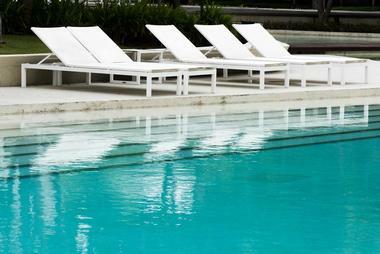 There’s a tropical lagoon for guests who prefer their recreation a little more on the leisurely side. One of the coolest perks is the chance to get up close and personal with marine life – from snorkeling and diving expeditions to swimming with dolphins. Scuba divers may even be lucky enough to dive with harmless nurse sharks. Multi-bedroom villas are perfect for family vacations. The award-winning Hawk's Cay Resort was voted as having the Best Hotel Kids Program in the country. 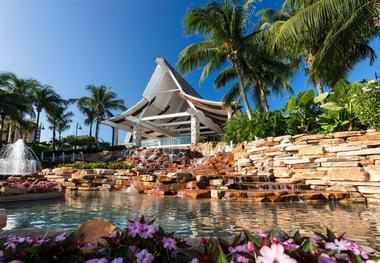 Guests at the Reunion Resort will love how near it is to Walt Disney World and Orlando International Airport. Luxury villas and vacation homes can accommodate families of any size. Full kitchens and dining rooms make family meals a breeze, and private balconies or patios give guests space to spend quality time together in warmth of the Florida sun. The property has two playgrounds, a supervised Kids Crew program on select days, and a 5-acre waterpark with poolside activities. Tennis and golf lessons are available for guests who want to improve their game. Casual dining facilities offer kid-friendly options, and in-room dining is available until 11 pm nightly. 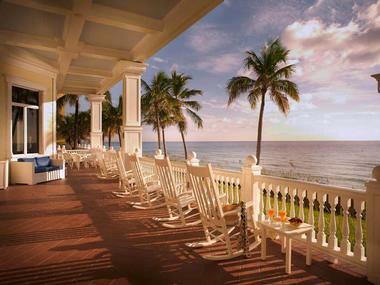 The Beachside Village is a charming New England-style resort with views over the Atlantic Ocean. Travelers have rated it the second-best hotel in the United States for customer service, and it's easy to see why. Making the guests' stays special is priority number one here. It's a perfect choice for pet owners, with a pet-friendly policy and even a dog-walking service. The resort also offers a variety of complimentary activities, including paddleboards, tennis facilities, and ocean kayaks. There's also weekly Friday Sunset Socials held at the side of one of the resort's two heated pools. For families with Disney obsessions, this one is a no-brainer. Based largely on a Lion King theme, the Animal Kingdom Lodge allows families to adventure together into lush savannas filled with exotic birds and wildlife. Over 30 species roam the park, including flamingos, giraffes, and zebras. The resort also boasts award-winning dining and an 11,000-square-foot pool designed to mimic an African watering hole; here, guests can channel their inner Pumbaa and splash to their heart's content. Animal Kingdom also offers supervised playtimes, so parents can relax too. For a little extra Disney magic, in-room celebrations are available. With four bars and clubs and located right in the heart of Miami Beach, Fontainebleau is an ideal choice for guests who want to enjoy Miami's renowned nightlife. Glamorous, modern, and filled with arts and music, the resort is an excellent option for parents who want to let their hair down a little. 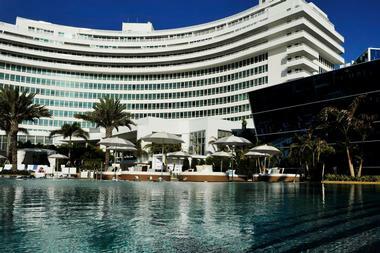 Fontainebleau facilitates this. Fridays and Saturdays see the resort host a Kids' Night Out, so parents can have their Big Nights Out unfettered. A Kids' Camp and daytime babysitting are also available. In addition to nightlife, guests can relax in the spa, rent an exotic car, or enjoy fine dining. With a private beach, Florida's only lazy river, and an elegant zero entry pool, this resort is imbued with old Florida grandeur. Pelican Grand Beach is a perfect choice for guests who want to kick back and do some serious relaxing. First, there's the location. 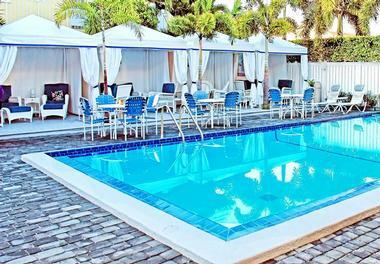 Set right on enviable Fort Lauderdale Beach, it offers guests stunning sunrises and ocean views every morning. Then, there's the Scandinavian-inspired intimate luxury spa, located high on the 11th floor of the resort. Accommodations for the family include guestrooms, suites, and luxurious premier suites. OCEAN2000 is the resort’s signature restaurant, with a beautiful dining room and beachside veranda. Families will love this luxury resort with its spacious residences and amenities that cater to parents and children alike. 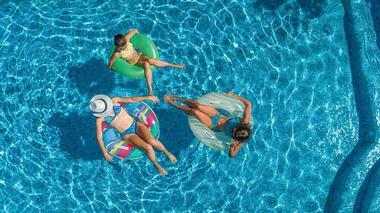 The resort is an oasis of fun with indoor and outdoor activities for adults and kids of all ages. Residences include private balconies, high-speed internet access, and fully equipped kitchens in the one and two-bedroom units. A variety of restaurants offering everything from burgers to seafood will please even the pickiest of eaters. Kids can enjoy their independence as they hang out at Camp Manatee and take part in planned activities while mom and dad relax at the Stillwater Spa or play a round of golf on the championship course. Outdoor adventurers will be in their element at Island Bay Resort in the Florida Keys. 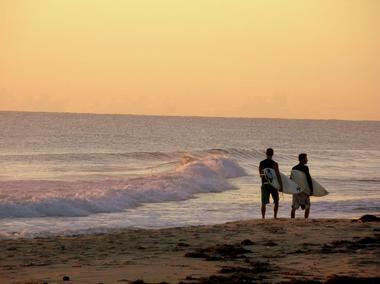 Guests of the resort can enjoy watersports of all kinds, right from the private beach and dock. After a day of fun in the sun at the resort in Tavernier, nearby Key Largo, or Islamorada, guests will appreciate being able to relax in air-conditioned comfort. Families can wind down after a busy day by watching the sunset from their cottage’s private patio while enjoying a meal cooked on the Weber grill. Tiki huts and hammocks add to the laidback ambiance. Cottages all include wireless internet, flat-screen TVs, and fully equipped kitchenettes. 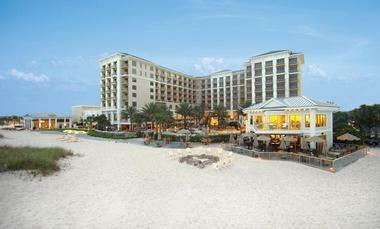 Set on a private white sand beach on the Gulf Coast, JW Marriott Marco Island is the ultimate family resort. Everyone will love spending the day in one of Quinn’s poolside cabanas with ceiling fans, televisions, and even a small refrigerator. For more adventurous families, the resort offers sailing trips on their private catamarans, guided WaveRunner excursions, and bike tours for adults and children 12 years or older. The younger set will love the supervised kids’ program at Tiki Tribe, where staff engage “campers” in fun and educational activities and take them to lunch at one of the resort’s onsite restaurants. Activities for every age and interest can be enjoyed at this contemporary beachfront property. 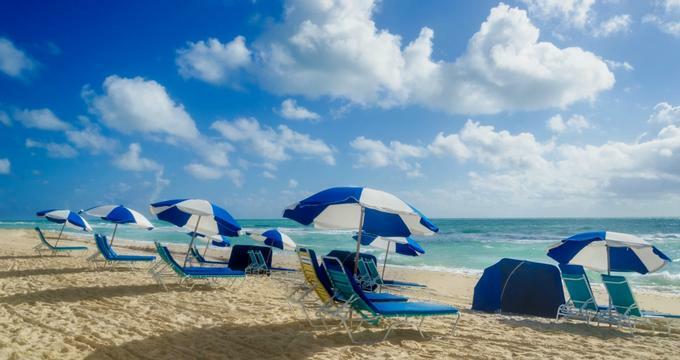 Fall asleep to the sound of the ocean in a spacious suite, grab a quick breakfast at Skimmer’s Coffee Bar or SHOR, and head to the beach to build sand castles, rent a mini-Segway, or indulge in a day of relaxation in your own private climate-controlled cabana. Guided educational activities await guests from 3 to 12 years old at Camp Hyatt. A typical day “at camp” might include water activities, crafts inspired by nature, free time on the playground, or walks on the beach. 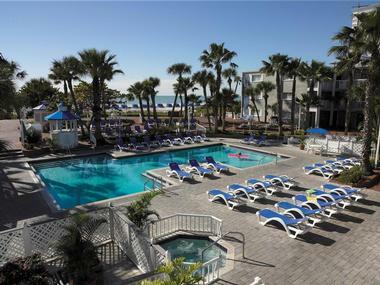 Accommodations have balconies overlooking the Gulf of Mexico and full kitchens. 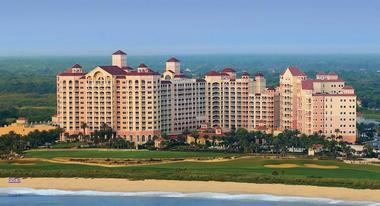 Sandestin Golf and Beach Resort is the perfect spot for families and groups of all sizes. 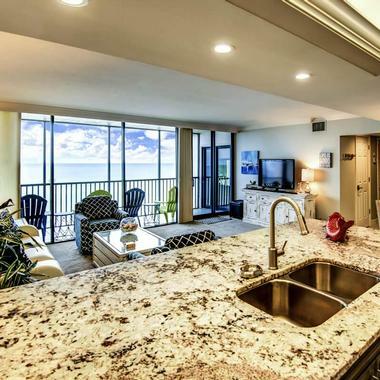 The accommodations at this Emerald Coast resort range from studios to full-size homes. Complimentary amenities for resort guests include bike, kayak, and boogieboard rentals, access to the fitness center, court time, preferred parking, and a tram service that transports guests throughout the resort. Families can spend time together on the mini golf course or at one of the four pools. The perfect ending to a day of family fun is a bonfire around a private fire pit on the beach, complete with beach chairs, a s’mores kit, and kiln-dried firewood. Every spacious guest room and oversized suite at the Sandpearl Resort has a view of the water and amenities that families will appreciate, including in-room Wi-Fi, twice daily housekeeping, high-definition flat-screen televisions, and refrigerators for keeping snacks on hand. An onsite four-star restaurant, climate-controlled lagoon-style pool, and private boat slips will make this a vacation to remember. Guests can shop for all the essentials like sunscreen and Starbucks at The Marketplace or pick up a souvenir at Collections, the resort’s signature boutique. Camp Ridley provides supervised fun for kids under 10 in afternoon and evening sessions. Captiva Island is home to this eco-friendly resort with generously sized accommodations in traditional hotel rooms, condos, beach villas, and cottages. Families are treated to seasonal activities for all ages at Skully’s Family Interactive Center. Educational programs teach interested guests about the wildlife in the 330-acre preserve that surrounds the resort. Full-service restaurants, a poolside tiki bar, and an old-fashioned malt shop are just some of the many dining options at South Seas Island. The Captiva Provision Company and Ships Store sell souvenirs and sundries. An in-house photographer is available for portrait sessions to preserve memorable family moments in this unique setting. The award-winning Sundial Beach Resort and Spa on Sanibel Island offers luxury accommodations and exclusive guest amenities. Island-style decorations create the perfect atmosphere for a relaxing family vacation. Units include multi-bedroom options, kitchenettes, screened balconies or porches, and garden or water views. Newly renovated, state-of-the-art sports facilities offer something for everyone, like Pickleball – a paddle sport with simple rules that is easy for beginners to learn and a great family activity. Guests have a range of dining options from pizza to sushi, and Turtle’s Pool & Beach Bar has a kids’ menu and virgin daiquiris to drink.